In the 1950's Roller Derby was a national rage. The San Francisco Bay Bombers ruled the sport and Joanie Weston was their star. She was a gifted athlete, perhaps the best of her era - she once hit eight home runs in a softball game. But the stigma attached to Roller Derby assured that she would never gain the recognition she deserved. She was sweet and utterly genuine, a good Catholic girl whom everybody loved. She was pretty, too, in a robust way. On the road, she kept such meticulous records that her colleagues called her "Wanda Bond," after Ward Bond, the celebrated wagon master of the TV series "Wagon Train." She traveled the highways with a little mixed-breed named Malia because, then, at night, after being saturated in the love of her admirers, when she came back to another lonely room in another Holiday Inn, the dog would provide her with "a little bit of home." 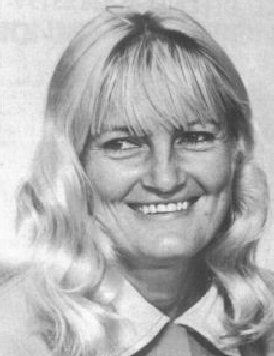 This was Joanie Weston. Ah, but on the banked track, she was transformed. Hear it now: No. 38 in your program, No. 1 in your hearts. The Blond Bomber --- 5 foot 10, 165 pounds, strong and agile, as superb a female athlete as ever there was. She kept her hair strawberry blond and a scarf knotted around her neck to make her as stylishly feminine as her (wonderfully) tacky orange and black attire permitted. Never mind swirling, pounding, commanding, she looked the best part of a Viking queen, sallying forth. At her peak in the 60's Joanie Weston was as famous a female athlete as Billie Jean King and Peggy Fleming. But, of course, she was famous with the wrong people. It wasn't tennis whites or figure skates she wore. 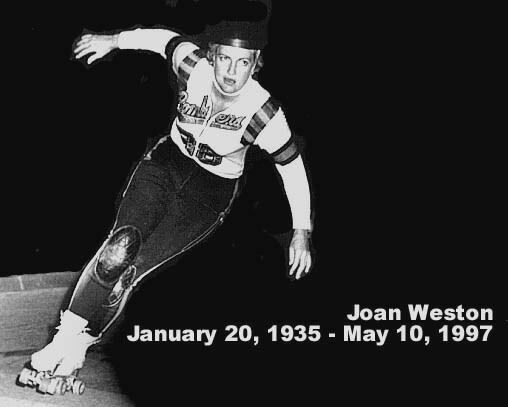 Joanie Weston was the star of the Roller Derby. When she would appear on "I've Got a Secret" or "What's My Line?" the big city sophisticates hadn't a clue who she was. Home in the Bay Area, though, or deep on the road, where the Derby tour followed after the grainy kinescopes that paved the way on local TV, Weston could only venture out in dark glasses and a kerchief. Weston mattered a great deal to those who made her the heroine in their lives. Especially, she mattered to frustrated young athletic girls. In a very real way, in fact, it is Joanie Weston who best exemplifies the American athlete of this century. She had grown up in Southern California, proficient at every physical thing she tried. She hit .730 one softball season at Mount Saint Mary's College, surfed the Pacific without a wet suit and once, in Hawaii, on a boyfriend's dare, threw herself off a waterfall. Later, she heard it was from that precipice that the natives had hurled human sacrifices. But how could an athletic girl profit by her prowess is she hadn't been schooled in the expensive "right" sports? So it was that young Weston joined the Roller Derby, and, in time, was ordained to replace Annis (Big Red) Jensen at pivot on the fabled, the legendary --- the sainted! --- Bay Bombers.
. . . Coincidentally, the Derby petered out of existence just as Weston herself began to slow down, approaching 40. She married another skater, Nick Scopas, and bred and showed her beloved cocker spaniels, until suddenly last fall, she began to deteriorate with what turned out to be a rare disorder known as Creutzfeldt-Jakob disease. Once, long ago, touring with Joanie and her little dog, somewhere in Dixie, I asked her about her curious hybrid sport. "All I want out of the Derby," she replied, "is to make good money, get out in one piece and, years from now, when I say I was in the Roller Derby, I want people still to know what it is. I want that." When she died, mercifully, on May 10, at 62, it was Joanie Weston's death that forced people to remember the Roller Derby again and made them wonder too how grand a figure of grace and glamour she could have struck, if only the world had been ready for her when she was the best there was.